There is nothing quite like the warm aroma of juicy apples and spicy cinnamon and nutmeg with a crunchy streusel topping. Apples are plentiful right now, so grab a bunch of them and back up this delicious pie. Use firm apples such as Granny smith, Gala or my personal favorite McIntosh. 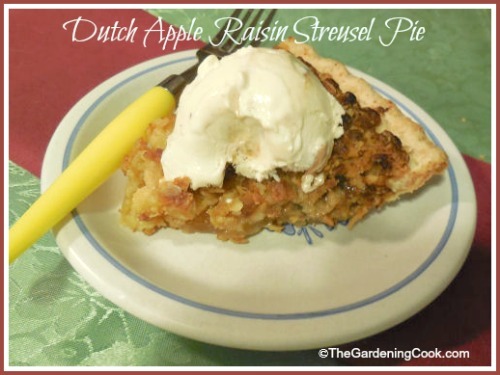 The crunchy oat topping adds an extra bit of flavor to this delicious apple pie and the raisins add a nice bit of extra nutritional value too. Raisins and brown sugar combine to take this apple pie to a new level. The streusel topping is delicious. 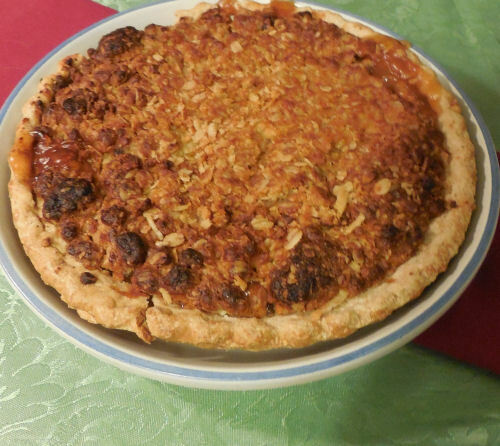 Preheat oven to 425 º F.
Line 9" pie pan with an unbaked pie crust. Core and slice apples and sprinkle them with lemon juice. Mix the sugar, nutmeg and cinnamon. Fill pie shell with apple mixture. and dot with 2 tbsp of the softened butter. Bake in preheated oven for 10 minutes. Remove and set aside. White the pie is baking, mix the together the flour, brown sugar and cinnamon. Mix in the rolled oats and lemon zest. Rub the topping ingredients and butter together with your fingers until the mixture is crumbly. Sprinkle topping over warm pie. Reduce the temperature of the oven to 375 º F (190 º C). 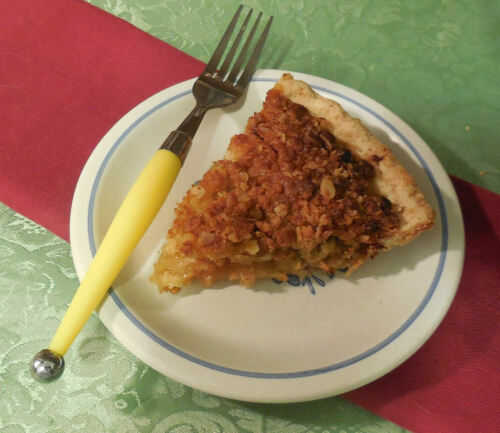 Bake the pie for an additional 30 to 35 minutes, until streusel is browned and apples are tender. To prevent excessive browning, cover the pie loosely with aluminum foil. Serve warm with ice cream or whipped topping. Enjoy! What a wonderful temptation. The print link will not work with me and I am wondering if anyone else has this problem?? Thank you. I will be writing this out the very first day my fingers will work for me.